My powder coating guy had gotten sloppy. His work used to be awesome and then it started, I would go to pick up parts and they would be seriously flawed. He sees the flaws and says … OH, I need to redo that. The problem was every time I would go to pick up parts over 50% would have big flaws. I knew he had to see the flaws, yet he tried to pass them off to me in hopes I would not see them. Powder Coated surfaces should not have bubbles or look like orange peel. I decided to do my own Powder Coating at Home. 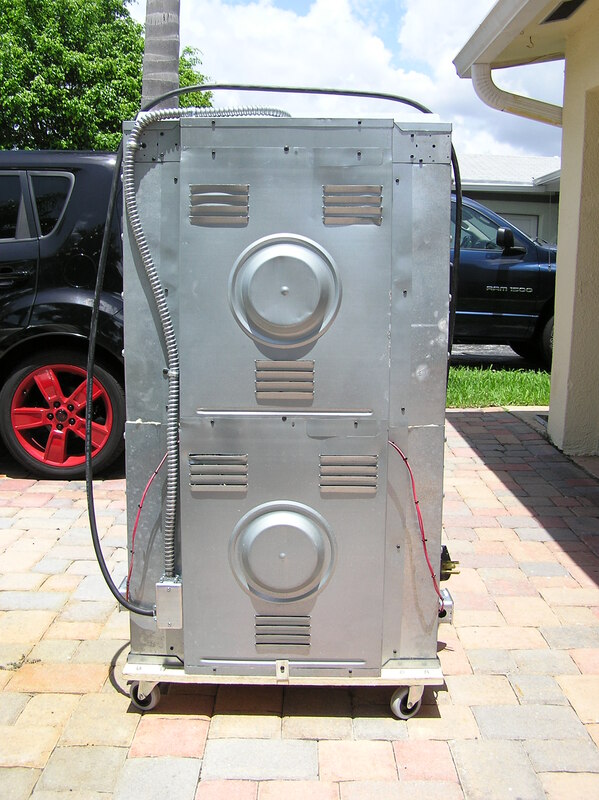 The powder coating gun and powder is very inexpensive. The oven is the killer !!! I need an oven that is at least 3 feet long inside. 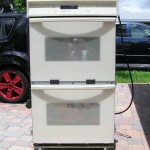 I went on Craig’s List and bought a Whirlpool Double oven for $80 from someone that just remodeled. 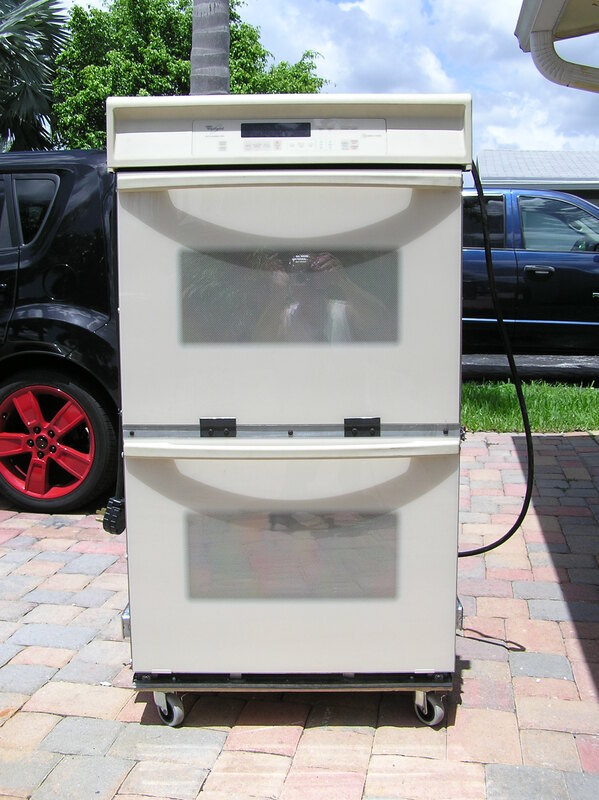 I took the Whirlpool 30″ Double Oven and cut it apart and put it back together as one oven. I have tested it with oven thermometers in different areas from top to bottom and I am really surprised by the consistent temperatures from top to bottom. I am going to do some test powder coating before I decide if I need any fans to circulate the heat. ( Under $250 including the oven! ). 2. Build it big enough to fit items up to 36″ long. 3. Keep it small enough to fit in my already overcrowded garage. 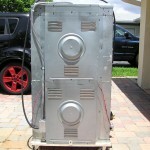 Next I will build a small spray booth and get to some powder coating. I have an oven that I want to do the same thing to. 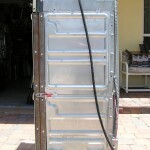 How did you remove the frame material between the two ovens? I used an air saw with a hack saw blade to cut them apart. Harbor Freight sells the Air Saw for a very good price. I also used a Metal Cutting Band saw to cut the pieces to size when assembling. Hope that helps. 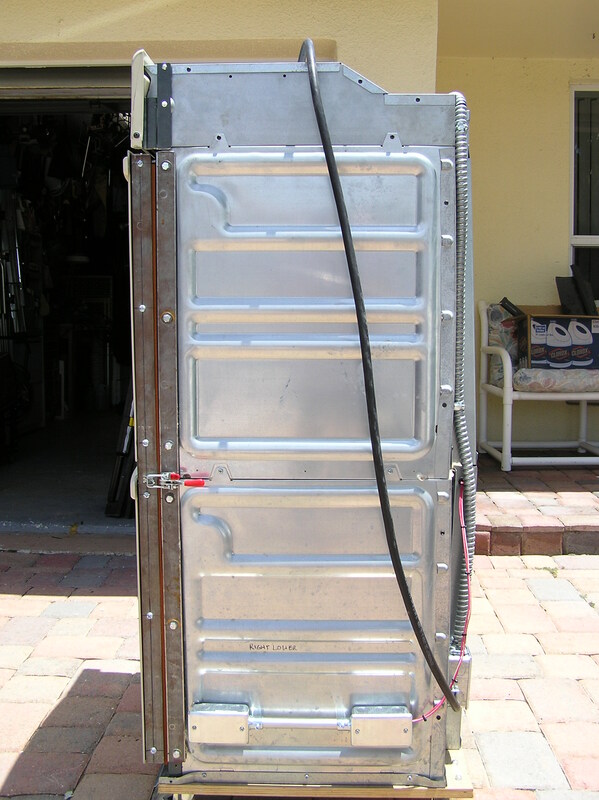 Did you relocate the bottom upper and bottom lower elements to the sides of the bottom oven? I cant tell if you kept the broiler element on the upper oven. filling in the gaps between the two ovens looks like it’s gonna be fun. Sorry, it has taken so long to respond. Ok, I took the Double Oven completely apart. Then I cut the upper and lower ovens to make them fit together. Cut the bottom off the top oven and the top off the bottom oven. I cut the leftover pieces into wide strips and used the cut off pieces to screw the oven back together in the same size. I bought a heavy duty hinge and bolted the doors together. Mounted the new hinge and doors to the oven. Used an automobile hood pin to guide the door when closing so it stays square and even. Got a latch for the door as well as high heat stripping around the inside of door. I relocated upper and lower baking burners to the bottom. I have the connections coming out the left and right sides instead of in the rear where they were. I put both exhaust fans along the top. One was there from the factory and put the second from the lower oven next to it. That was the difficult part of the is build. 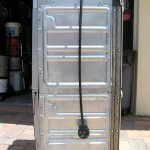 What did you use for the gasket around the door? i t looks silicone’ish. Finally got the front off the oven. Man this thing is gonna be a pain isn’t it? Trying to decide on how to tackle the cutting. Pull the sides off then pull ovens out or try and slide them out, leaving the sides attached at the top and bottom, or cut an peel away as i go with the ovens intact. I already got the doors figured out and the bottom burners mocked up to drill holes for element connectors. I see why you used the metal boxes to hide the end of the connectors. 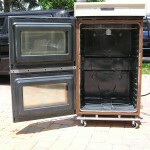 I am in the process of replicating your effort to create a double oven into a powder coating oven. Just wondering if you would change anything you did originally if you had to do it over again? The only change would be to run a small vent duct toward the rear or straight up since these in wall double ovens vent out through the front. Post a pic when you are done. Would love to see it. Did you run both elements from one temperature control? No, I ran them separately. My cousin and I are getting into powder coating. 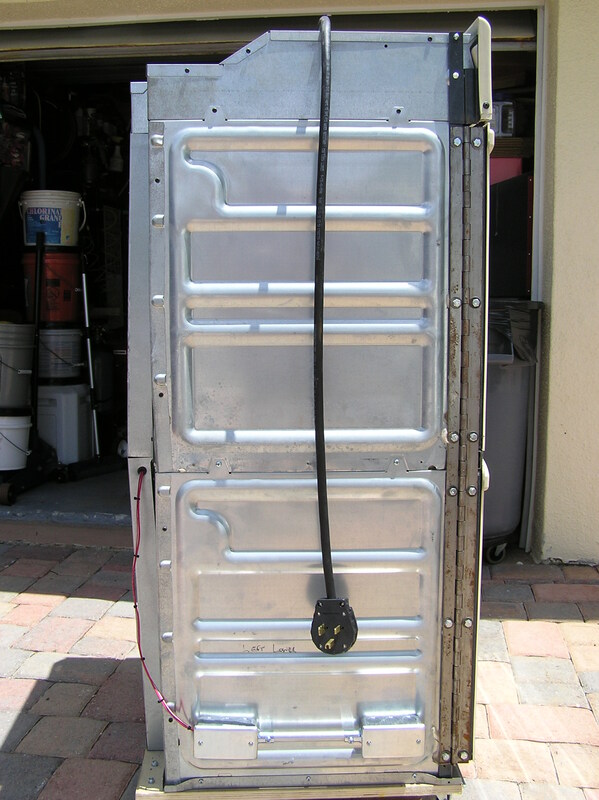 Ive been doing research everywhere and seeing “pregnant” oven hacks. But they look just like that, a hack. This is by far the greatest DIY idea I’ve come across. You say the elements are still controlled separately. So are there still two temperature sensors? And do you just set both controls at the same temperature? For example if im baking at 380 would i se both controls to 80? Thanks in advance! This is such a great idea! Yes, Two temperature sensors. I spaced them apart in the oven and set both controls to the same temperature. I was hoping that spacing them out in the oven would help give more of a uniform heat. You said you wanted to see pictures. Mine is not as pretty as yours but it works. I had to stretch it. Not sure if I can post this link but if not let me know how I can post pictures. That came out great!!! Have you tried it out yet? No got it up to 500. let run for 20 minutes worked good. Did like you said put one of the thermostats halfway up and used both controls. It was a lot of sheet metal work. I made a new door frame out of angle that i had laying around and put an old copier dolly under it. Extended the door with some uni-strut. 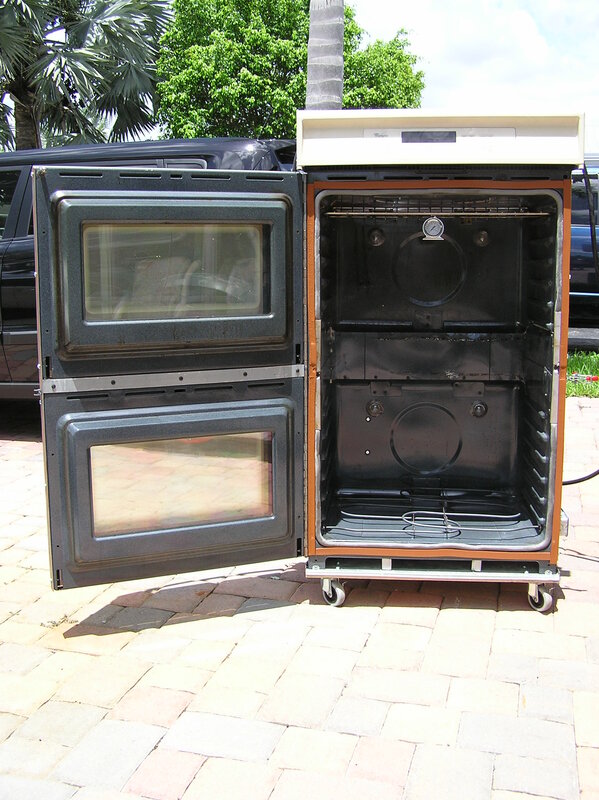 The only thing i need to do is put some stabilizing legs on it, with the new frame on the front it is kind of heavy and if you open the door up the oven will tilt to the hinge . I have some left over uni-strut to do that. I will post again when i do my first run. You should see fans and a shroud the direct the exhaust.. you would need to change the way it directs the exhaust. Not all ovens are the same. The one I did , I was going to mount the fan backwards so the air blew to the rear and them use some sheet metal to make a duct. I wired it with a Dryer plug so I could plug it in when I needed to use it. My washing machine and the dryer were in the garage.